I’ve been collecting Memphis design for twenty five years and I watch the market for early vintage Memphis pieces being sold by auction houses and at dealers in the U.S. and Europe. Newly made versions of the original Memphis designs can be bought in Italy but the early vintage pieces will always be worth more as collectible design. What I mean by vintage Memphis pieces are the ones that were actually made during the 80s Sottsass involvement from 1981-1987. These early pieces also have a more intrinsic value as design history and will be a better investment in the future than the newly made versions of the same design sold today in Italy. Fortunately as a collector you can buy vintage Memphis-Milano at lower prices than the newly offered versions sell for from Italy especially when you consider the high Euro prices and expensive shipping and insurance costs. Many vintage pieces have lost the glued on metal ID tags over the last thirty years but they are indeed original, authentic versions. I’ve never seen any “fake” Memphis on the market as some in Italy have said. They claim this to discourage vintage sales at auction or from dealers in order to sell the newly made versions. 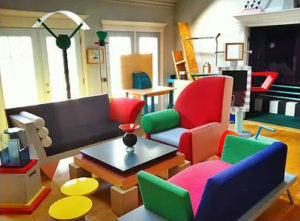 Auction houses such as Wright, Rago, L.A. Modern, Phillips, Sotheby’s and even Ebay at times sell original Memphis pieces. Bottom line……..remember that it’s best to buy vintage instead of new from Italy even if they are a little worn from age. * All of the photographs shown on this website are of my own personal collection of vintage 1980s Memphis design in my home and were bought and photographed by me, Dennis Zanone. The site and opinions and comments are my own and for general interest and educational purposes under “fair use” and not for re-sale so therefore do not infringe on any copyright in any way.